While most of the fame goes to the quarterbacks, wide receivers or running backs who score touchdowns, kickers play a vital role on the field in consistently performing for points after touchdowns (PATs) and field goals. Sophomore Zach Murphy is in an even more overlooked position — that of the backup kicker and probable kickoff specialist. In high school at Ravenscroft in Raleigh, N.C., Murphy was the team captain and still holds the Ravenscroft School record with a 50-yard field goal. As a junior and senior, he was named All-Big East and he was named to the NCISAA all-state team in 2016. Over his high school career handling both kickoffs and place kicking, he converted 13 career field goals, 94 PATs and had 27 touchbacks on kickoffs as a senior. In 2015, Murphy helped Ravenscroft to the 2015 NCISAA Division Two state championship. 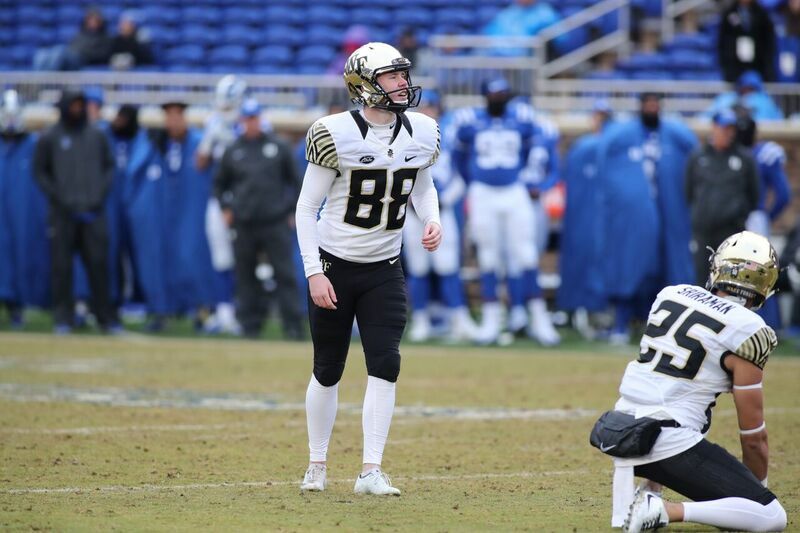 Now, going into his redshirt sophomore season with openings on the kickoff squad, Murphy looks to provide the consistency the Deacons need from their specialists and give the Deacons great field position to allow the high-powered offense to go to work. Samantha Wexler: As a specialist, your training and practices must look different than the offense and defense. What does a typical practice look like for the group? Zach Murphy: Our practice is definitely not as intense as the offensive or defensive players, but we are always working. Most people don’t realize the importance of the chemistry of the specialists. The specialists are a cohesive unit that has to be confident in our skill area, but also trust the other guys. We are consistently working individually on our set skills, but also as a group to perfect the rhythm and timing. For specialists, our individual practice is a lot like a golfer going to the driving range to work on specific parts of their game. It really is about muscle memory, so we don’t have to think about it in practice or in a game. During practice, we typically have a field goal period and then we have a couple periods working on other special teams units — kickoff coverage and return and punt coverage and return. When the specialists aren’t needed for a certain practice period, we are usually with Chris Jones (strength coach) working on flexibility and mobility, or this is when we will be working on skill training by ourselves. SW: How has spring practice gone so far and what are you looking forward to as the season progresses? ZM: Spring practice has gone well so far. It actually goes by quickly, and I believe that we have made good progress as a team in working for the upcoming season. Some guys are learning new positions, and there are always competitions, which makes us stronger as team. I am really looking forward to the success that we continue to build on. I think this team has the chance to do something special in the fall and make history again. SW: There has been a very high standard of play under this coaching staff, having won three straight bowls. What in particular do they bring to the program to continue to compete in the ACC? ZM: Coach Clawson and all of the other coaches are constantly seeking players who love the sport. Wake Forest is a hard academic school and the coaches are looking for players who will appreciate the Wake Forest education combined with the ability to play Power-5 football. The coaches hold us accountable and do a good job of making sure we are prepared to perform at a high level. 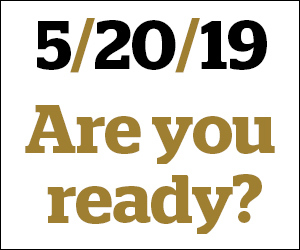 SW: All of the football facilities are definitely top notch and still growing.How will those help with both the future and the present of Wake Forest football? ZM: The new weight room, the indoor practice facility, the sports medicine facility and the Sutton Sports Performance Center are all essential to our continued success. These facilities are definitely among the best in the country, and it’s really exciting to experience all the new improvements daily as the team trains. It’s important for recruits to see the commitment that Wake Forest is making to football. The quality of the facilities will only help the future of the program, as it gives us the necessary tools required to be competitive in the ACC. SW: What’s your favorite Wake Forest football memory so far? ZM: Narrowing down to just one favorite memory is hard, but it would be between scoring my first collegiate point against Rice, the Belk Bowl and Birmingham Bowl wins and definitely beating NC State twice — especially at NC State this past season. Previous MVP Race: “Greek Freak” Or “The Beard”?